The Campus Cabinet Food Pantry is now open every Wednesday (that the University is open) from 5-7 p.m.! Help us help you in a more timely fashion by submitting your forms on Monday prior to your Wednesday visit. Thanks! If you are new to the Campus Cabinet you will be asked to fill out a short application on your first visit. The information provided on this form will only be seen by the staff responsible for the food pantry and used for internal reporting. Personal information will be kept confidential and only statistical information will be used. By filling out this form online prior to your first visit, it will save you time when you come to the pantry. We respectfully ask that this form be submitted to us by Monday prior to your Wednesday visit for better service to you. A web-based form, as well as a fillable PDF are available below in the "How Will It Work" gray tab or above at the Campus Cabinet Forms link. To help the volunteers in the Campus Cabinet Food Pantry know better how to serve you, please fill out this form prior to each visit. We'll make every attempt to fulfill your requests, but please know that we are limited by the types of food donated/purchased. We respectfully ask that this form be submitted to us by Monday prior to your Wednesday visit for better service to you as it will help us to prepare a bag of food prior to your visit. Want to have a Food/Monetary Drive? If YOU would like to hold a food drive, see information "How Can You Help" below. See the "How Can I Help" tab to fill out a Volunteer Application Form. We've started a helpful list of the Alva churches and faith-based organizations that provide free meals to students including where and when. 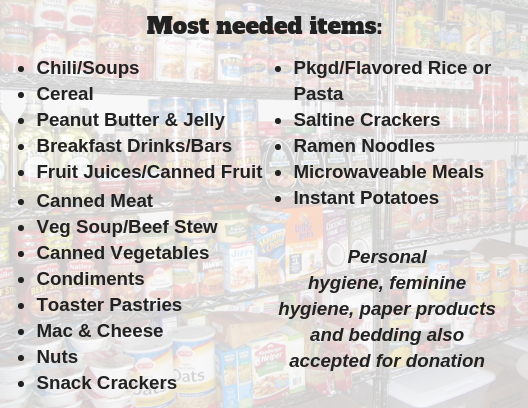 This list also provides the location of the local Alva food pantry, other resources that could be helpful, the Teacher's Closet, Warmth for Winter and more. Please let us know if you have something that could be added to this list. Wednesdays from 5 to 7 p.m. If you are unable to come on Wednesdays, please make an appointment with Angelia Case at (580) 327-8577 or arcase@nwosu.edu or Andrea Lauderdale at (580) 327-8606 or amlauderdale@nwosu.edu. 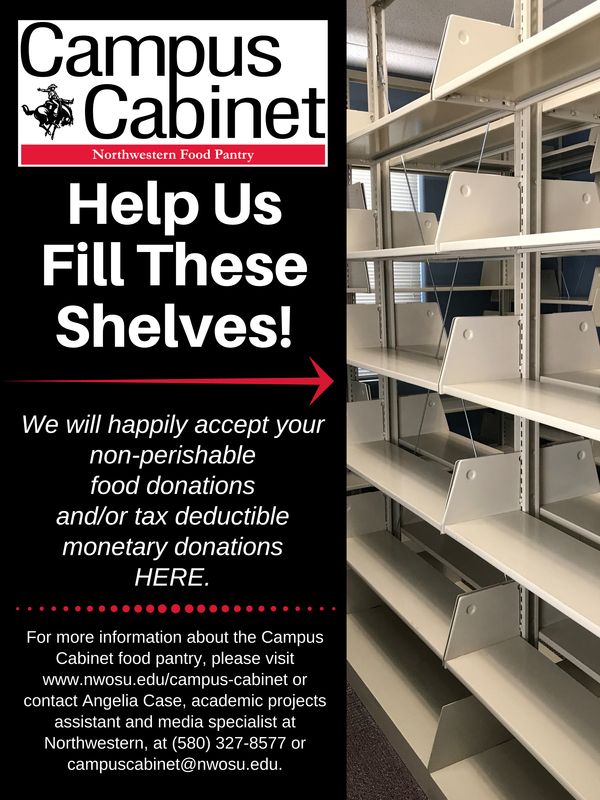 The Northwestern Campus Cabinet food pantry mission is to provide supplemental food and other basic necessities to alleviate food insecurity and barriers to student and employee success. Food & Hygiene Product Donations Needed! Facial tissues, toilet paper and smaller packages of tampons/pads, etc., also are needed. We also have a need for food items for individuals who are vegan and vegetarian. Packaged fruits, snack foods, drinks – like sports drinks and breakfast drinks. Pop top canned items are perfect, but not required. Thanks! All donations are appreciated, and we'll do our best to find a spot for everything! Monetary donations accepted as well! See next gray tab for more info! Tax deductible monetary donations may be made via the Northwestern Foundation. 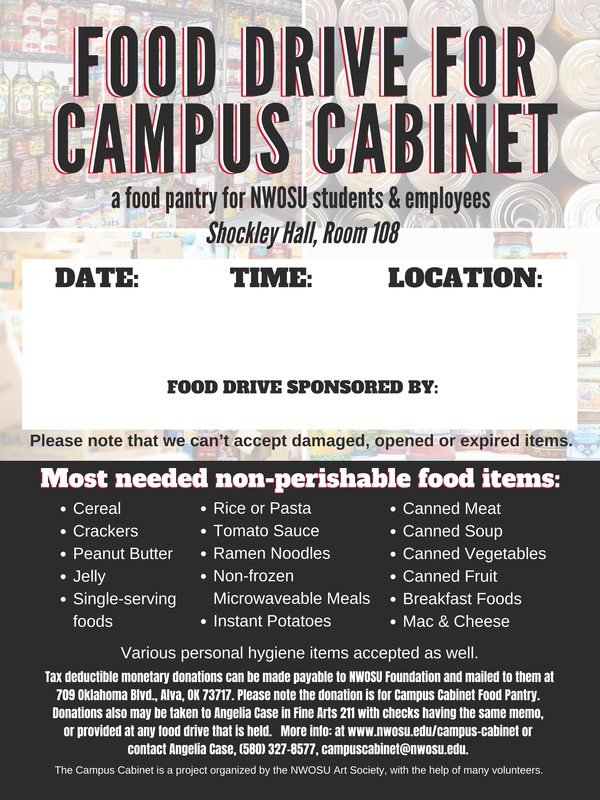 Please make checks payable to NWOSU Foundation, and list in the memo section "Campus Cabinet Food Pantry." Checks may be mailed to 709 Oklahoma Blvd., Alva, OK 73717, given to Angelia Case in Fine Arts 211 with the same memo, or provided at any food drive that is held. Who is the pantry for? Who may use the food pantry? All students and employees with current Northwestern photo IDs. Students also may need to show proof of enrollment, and employees may need to provide a current pay stub to show employment at the university. How will the Campus Cabinet determine need? Students and employees at Northwestern will be served based on good faith. It will be assumed that individuals who utilize the Campus Cabinet are there because they need it and will not abuse it. What is the cost to Northwestern students and employees? Nothing. All items are free. How often may a Northwestern student/employee visit the Campus Cabinet? Students and employees may visit the pantry once a week on Wednesdays from 5-7 p.m.
upon the first visit. We ask that this form be submitted a few days prior to your visit. The first time you come to the pantry, all students also must show proof of enrollment at Northwestern in the current semester, and employees must show proof of employment at Northwestern. After eligibility is confirmed and paperwork complete, a Campus Cabinet User's Card will be issued. You will present this card and a valid Northwestern photo ID each time you come to the food pantry. The web version of the First Time User Application will email directly to the Campus Cabinet. You may attach the fillable PDF to an email and send to campuscabinet@nwosu.edu or place it in the box outside the office of Angelia Case in Fine Arts 211. If you submit the PDF form by email, a written signature may be added to it when you visit the pantry. by Monday prior to your visit on Wednesday so that we can prepare a bag of food for you according to the answers you've provided on the form. You will need to submit this form each time you plan to visit the pantry. The web version will email directly to the Campus Cabinet. You may attach the fillable PDF to an email and send to campuscabinet@nwosu.edu or place it in the box outside the office of Angelia Case in Fine Arts 211. By filling out these forms in advance, it will save you time in the long run on the day you visit the pantry. We will have paper forms available at the pantry if you aren't able to fill one out online. Please Note: Some items listed on the Food Request Form may not available as we are limited to the foods donated. Answers provided on the form will help us to understand what foods are interested in so that we can try to accomodate in the future. Besides making tax deductible monetary donations, you can help us by sponsoring a food drive, donating non-perishable foods, and volunteering to help work in the food pantry. and enter in your date, location and sponsoring organization. Or, you can create a poster of your own to publicize your drive. Let us know, and we can help you publicize your drive, too! Accept Food/Monetary Donations where you are! Please help us collect non-perishable food, personal hygiene items, monetary donations in your building, office, business, etc.! Here is a poster you can print out and use to tell people they can donate at your place. Let us know, and we can add you to a list of where people can donate. In this area we hope to pass along news about the pantry and other noteworthy information. ENJ Financial selected the Campus Cabinet as its charity for a $500 donation for International Day of Charity in September 2018! Thanks, ENJ! Had a "soft open" for students prior to the winter break.